What better way to introduce you to the new Fruit Stand Collection then show you what one of our Design Team girls, Amanda created with it...FRUIT. This fun summery collection is sure to brighten your day and uplift your heart!! GIVEAWAY: Like last week with our Flower Box Collection, we will be giving away one FULL collection and two sample collections of the new Fruit Stand Collection. Start pinning the projects from week to pinterest and hashtag them #DoodlebugFruitStand and you could win!! Just click the "Pin It" button at the end of this post to make it easier to pin your favorites! Hi everyone! Amanda here today with a bright and cheery decor idea that will make you wish summer was already here! 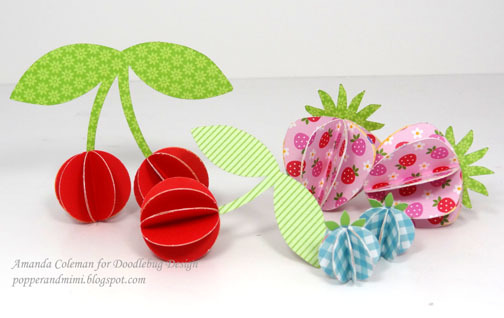 I couldn't resist the delightful little fruits in Doodlebug's new Fruit Stand collection. Everything looked so juicy and yummy I was eager to bring those papers to life! 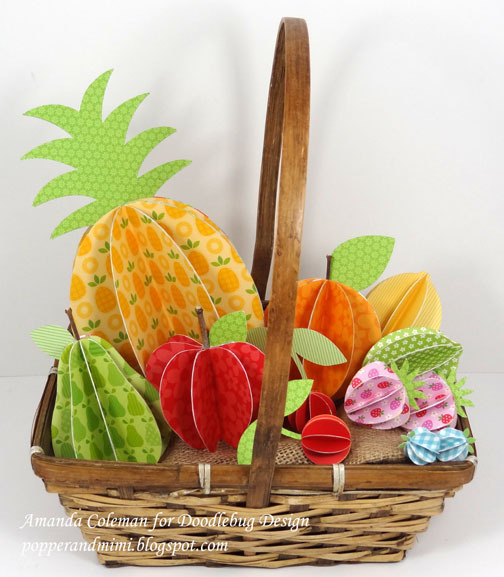 Several die cuts and folds later, I had a basket full of delicious-looking 3D paper fruit. Wouldn't this be perfect as a centerpiece at a summer party or picnic? Add a tag to this fun basket and it would also make a fun gift. I made a bright and stripey coordinating tag with a play on words. I used a fine-tipped Sharpie pen to add fun faces to the fruit cocktail Doodle Pop dimensional stickers. 3D fruit is super easy to make. For each fruit, I die cut or punched 8 of each fruit, folded each down the middle, and then adhered each piece back to back. When choosing cut files, choose shapes that are symmetrical. Since all of the fruit was tucked into a basket, here are some more detailed photos of each fruit. 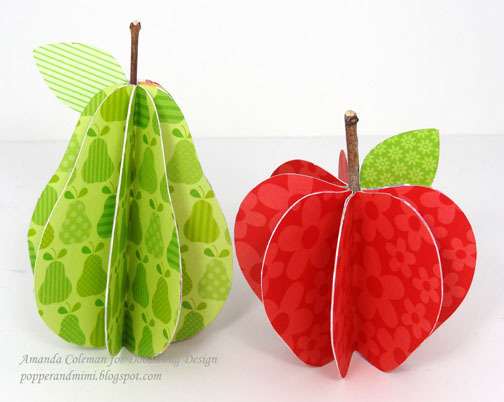 Click HERE for the pear cutting file and click HERE for the apple cutting file. I used THIS file to cut the leaves. To add a bit of authenticity to each fruit, use real twigs as stems. 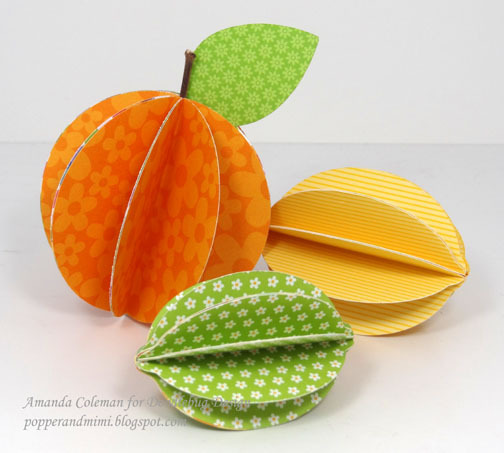 I used a 3" round punch for the orange and THIS file for the lemon and lime. I used a 1" circle punch for the cherries and THIS file for the cherry leaves. 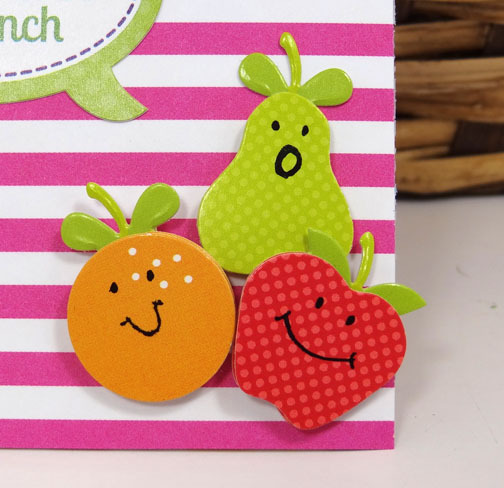 I used THIS file for the strawberries and a 3/4" circle punch for the blueberries. The blueberry leaves are stickers from the Fruit Stand collection. I used THIS file for the pineapple. 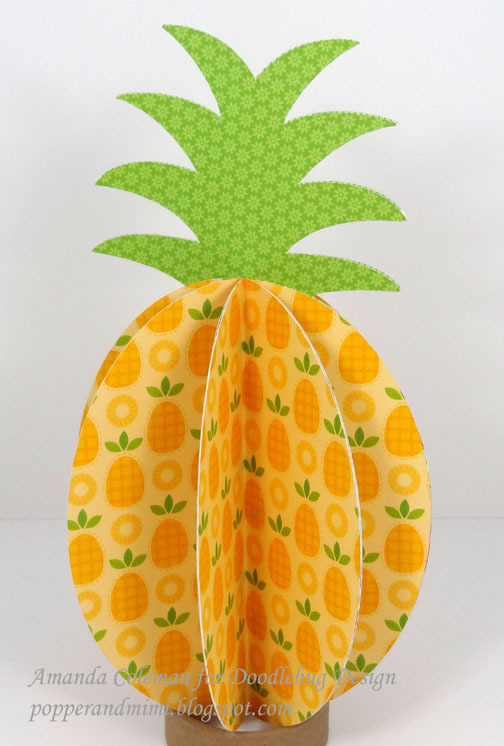 Cute little paper pineapple, huh? Which 3D fruit is your favorite and what would you make it for? Gorgeous ! Stunning ! Awesome ! Amazing ! Totally darling! Love the cherries and the tag, pinned both! so so cute, I've pinned my favourite! I just LOVE these projects! These are too darn cute!!! I like the strawberries! Wow - what fun three dimensional projects - they are so bright and cheery!! I love this idea and this collection is just as cute as you'd expect it to be coming from Doodlebug!!! I just had to say--this is adorable! I think my favorites are the berries and cherries! Oh my goodness, truly fantastic!!!! I tried to hashtag, but this is my first time, and don't know if I did it properly. Love your designs. So cute. Love them all. Oh my gosh - I LOVE these! My favorites are the cherries and the apple. So much fun! Love the faces on the fruit!